Stream stocking is in full swing, so try and catch some fish at any of our stocked streams. Family fishing is good at Woods Canyon and Show Low Lake. If you’re interested in catching any fish, for a novice angler or for someone’s first fish, try using a small piece of a worm on a small hook (size 12 or smaller) and dangle it in the shallow cracks between rocks. 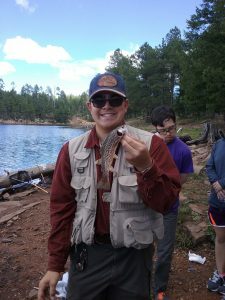 Try your luck at Woods Canyon or Willow Springs Lakes for the recently stocked Tiger Trout! Bear Canyon Lake will be stocked this week with 10+ inch rainbow trout. BEAR CANYON LAKE – Fishing is good. The lake will be stocked with 10+ inch rainbow trout! Try fishing a few feet deep. The water towards the top is fairly warm for trout. BLACK CANYON LAKE – Fishing is fair/poor. Try in the evenings or mornings. CHEVELON LAKE – Fishing is fair for carryover rainbow trout wild brown trout. The lake was stocked last month with 10+ inch rainbow trout! There was an algae bloom recently. The access to Chevelon Lake is difficult, requiring a long steep hike or ATV ride down to the dam area. Fishing regulations on Chevelon Creek upstream and downstream of the lake (to Chevelon Crossing) now match lake regulations, artificial fly and lure only with a 2 trout daily bag limit. WILLOW SPRINGS LAKE – Fishing is good/fair. The lake will be stocked with tiger and rainbow trout this week! Boat fishing is good. Try in coves on shore. Fish about 10 ft deep, where the water is cooler and still has oxygen. Rainbows can be caught on PowerBait or roostertails. Tiger trout are more aggressive (like brown trout), try using lures from shore or trolling, but can be caught on PowerBait. Kastmasters, spinners, spoons, or flies like wooly buggers or nymphs work well. Tiger trout can be distinguished from rainbow trout by their worm-like or blotchy pattern on their body compared to the rainbow trout small black spots. Tiger Trout count toward your 6 trout bag limit. WOODS CANYON LAKE – Fishing is good/excellent. The lake will stocked with Tiger and rainbow trout week. Try fishing about 10 ft down where the water is cool and still has oxygen. Rainbows can be caught on PowerBait. Tiger Trout are more aggressive (like brown trout), so try using lures near shore or trolling, but can be caught on PowerBait. Kastmasters, spinners, spoons, or some flies like wooly buggers or nymphs work well. Don’t forget to submit your trout for the state record! Tiger trout can be distinguished from rainbow trout by their worm-like or blotchy pattern throughout their body compared to the rainbow trout small black spots. Tiger Trout count toward your 6 trout bag limit. Sunfish can be easily caught using a small hook and small piece of worm in rocky shoreline areas. These are great fun for kids to catch, but might not be big enough for eating! FOOL HOLLOW LAKE – Fishing is poor for trout. Poor water quality conditions have caused us to cancel stockings for the rest of the year or until conditions get better. Try fishing for bass with lures or catfish with chicken liver on the bottom. Lake level is low, but boats are launchable. Also, try fishing for sunfish in shady spots off the fishing pier or in shadows of the rocks with a small hook (size 12 or smaller) and a small piece of a worm. This can be quite fun for kids (and adults)! RAINBOW LAKE – Fishing for trout is poor. Bass fishing is fair. The weeds may make boating a bit tough this time of year but boats are still launchable. Try fishing for bullheads or catfish using a worm on the bottom. SCOTT RESERVOIR – Trout and catfish fishing is fair. Try fishing for catfish using chicken liver at night on the bottom. A fish consumption advisory (FCA) for mercury in largemouth bass was issued by ADEQ. This FCA advises adults to eat only 2.5 ounces of largemouth bass per week and for children under 12 to eat 0.5 ounces per week. SHOW LOW LAKE – Fishing is good/fair. Large “supercatchable” trout were stocked last week. Fish 10 to 15 ft below the surface. Fishing for bass and walleye is fair. Also, try fishing for sunfish in shady spots off the fishing pier or in shadows of the rocks with a small hook (size 12 or smaller) and a small piece of a worm. This can be quite fun for kids (and adults)! WOODLAND LAKE – Fishing is poor for trout. Try fishing for sunfish in shady spots off the fishing pier or in shadows of the rocks with a small hook (size 12 or smaller) and a small piece of a worm. This can be quite fun for kids (and adults)! Also try fishing for catfish using a night crawler on the bottom. PATTERSON PONDS – This is a new community fishing water in St. John’s. A regular fishing or a community fishing license is required to fish here. Rainbow trout were stocked in March and fishing is good. Chanel Catfish and sunfish were stocked earlier in June! The pond daily bag limits in the community fishing waters (2 trout; 2 catfish; 5 sunfish) regulations apply. BECKER LAKE – Fishing is good. Tiger trout were stocked here earlier this year and are starting to bite on the surface and subsurface. Try beetles or hoppers on top and simiseal seeches stripped subsurface. Or try small zebra midges. Becker Lake is open to catch-and-release only for trout, artificial fly and lure only; single barbless hooks only. No trout may be kept. The water is warm this time of year, which stresses out fish. Please release trout immediately after catching them so fish are less stressed. BIG LAKE – Fishing is fair. The lake was stocked last month with 10+ inch rainbow trout! Try trolling with cowbells. There is a small algae bloom, but no large floating masses. CARNERO LAKE – Fishing is fair. The lake is building up with weeds, so fishing from a small boat is best, however weeds are really starting to choke areas out. Tiger trout were stocked here in early summer! They are aggressive fish and like to chase flies and lures. Try a panther martin or similar lures. There is a 2 fish bag limit is on this lake. CLEAR CREEK RESERVOIR – Fishing is poor for trout, but fair for sunfish, bullheads, and bass. CONCHO LAKE – Fishing is poor to trout. The lake was stocked the first week of March with rainbow trout. Try fishing this lake for catfish, it was stocked with them in early summer. Use a night crawler on the bottom. CRESCENT LAKE – Fishing is fair/poor. Fish were stocked, however poor water quality may make fishing difficult. But, a recent fish survey found 12-14 inch fish! Give this lake a try. Weeds may be restrictive to launching a boat with a motor. Try a kayak. GREER LAKES (River; Tunnel; Bunch) – Fishing is fair. Boats cannot be launched. HULSEY LAKE – Fishing is poor. Hulsey Lake is back and improved with two fishing jetties! Try fishing deeper as the water warms. LEE VALLEY LAKE – Fishing for grayling is poor as the water heats up and water quality diminishes. Small boats are launchable. Apache Trout will not be stocked here this year and surveys did not find any this spring. LUNA LAKE – Fishing is fair. The fishing has been on and off, but anglers are catching some large trout. There is an algae bloom and the water quality is poor. Try PowerBait with garlic, any color. NELSON RESERVOIR – Fishing for trout is fair. The lake was stocked and there are some large carry over trout. A 14+ inch rainbow trout was recently caught. There is an algae bloom. EAST FORK of the BLACK RIVER – Fishing is good. The stream was stocked last week and this week. Wild brown trout are also present in the stream. Monsoon storms can bring high waters and flooding. LITTLE COLORADO RIVER in GREER – Fishing is good. The stream was stocked this week and last week. Wild brown trout are also present in the stream. Monsoon storms can bring high waters and flooding. SHOW LOW CREEK – Fishing is fair. 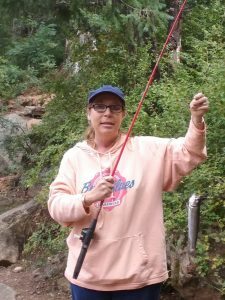 SILVER CREEK – Fishing is good. The upper section is now closed to entry and fishing from April 1 through Se ptember 30. Monsoon storms can bring high waters and flooding. SHEEPS CROSSING/LCR – Fishing is poor and not recommended. This stream will not be stocked this year due to a pathogen in our hatcheries. Please check the Department’s webpage for more information.